Midwives take care of individuals during pregnancy, labor, birth and the postpartum. When delivery takes place in the home or birth center setting, the midwife is also responsible for taking care of the newborn. Midwives may also provide gynecology services. “ The Midwives Model of Care™ is based on the fact that pregnancy and birth are normal life processes. 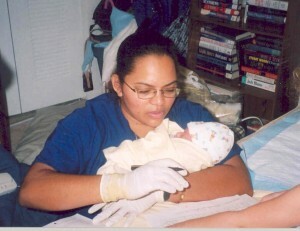 Direct­-Entry Midwives are educated or trained as midwives without having to become nurses first. They may be Certified Professional Midwives (CPMs) or Certified Midwives (CMs). The legal status and requirements for direct­-entry midwives vary from state. They are usually licensed in individual states as Licensed Midwives (LMs) or Registered Midwives (RMs). The Midwives Alliance of North America tracks the laws and regulations in each state for direct­-entry midwives. Nurse­-Midwives are educated and licensed as nurses first, and then complete additional education in midwifery. They are known as Certified Nurse­-Midwives (CNMs). CNMs are licensed to practice in all 50 states. They are usually licensed in individual states as Nurse Practitioners (NPs).